At the first look, this statement might look inverted. But do not interpret it from your individual perspective but from the perspective of a group of individuals, better known as society. Whenever, a person tries to do something out of the box, something that is unconventional, not in tune with the acceptable tenets of the society, he is often called a fool. But once this fool succeeds in his endeavour, the wise owls conveniently follow the path set by him, hence saving themselves the hard work and experimentation. So when, Bohemia, claimed to be the first Punjabi rapper in the world; made this statement, most of the youngsters sitting around him, sipping their coffees at Barista, got confused at first. We had reached the cafe after spending time at Missionaries of Charity's Chandigarh Center where Bohemia had also joined us for a community service activity organised by We Volunteers, an organisation founded by my old friend, Preetarjun. Bohemia eloquently shared with us his life journey from a mother-less boy at a young age in Pakistan to California based popular rapper. My non-Punjabi readers (and even me for that matter) must be knowing him from his recent Bollywood connection, the song 'Aadmi khilona duniya ke khel me' from 8x10 Tasveer and the Chandni Chowk to China title song. Talking to us, he soon turned into a counsellor, talking about careers and our likings. He admitted that sometimes, he feels he should have studied more. He had dropped out of High School, not because of his lack of interest in education, as he claims but because of poor American education system which he had to adopt around adolescence on moving to U.S.A. To us, he advised that we might not always get what we want but we have to find ways to move on. Taking a leaf out of his own life, he explained that his favourite genre is Ghazals and Shayari and he counts not a single rapper among his favourite singers, the list topped by Mukesh, Jagjit Singh and Nusrat Fateh Ali Khan. So how did he become a rapper? Pointing towards his glass of Mango Smoothie, he continues; the lyrics are like a juice while the music and vocals are the glass, straw and other peripherals, just a means to convey the message contained in the lyrics. So when, he realised, he won't be able to sell his lyrics through ghazals, he decided to try something new, hence becoming the first Punjabi rapper in the process. This title was given to him by the BBC Radio 1 after his first music album became one of the top ten most requested songs on the station in 2002. Usually, I would have skipped writing about this hang-out with Bohemia and concentrated more on the fun-filled time spent with young orphan and differently abled children at Missionaries of Charity. However, he impressed me with his clarity of mind and humility during those couple of hours at Barista, so I thought of sharing it with my largely non-Punjabi Blogger Buddies. Well, his statement is pretty true, as soon the other kids like Arjun and Salim (both physically differently abled) clustered around me, demanding me to draw a rose, tree or river on their sheets too. 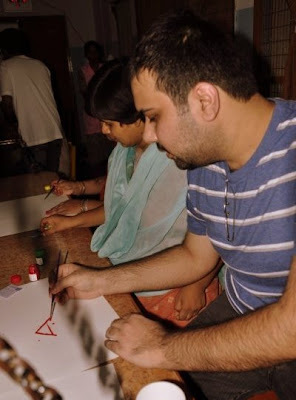 It was fun revisiting my childhood hobby after a long time and at the same time becoming a reason behind their smiles. And yeah, before this event got started, I spent some time with the young orphan children (by young, I mean toddlers). Two of them got into a competition of attracting my attention; with their ta ta ta ta's and innocent smiles, the only modes of communication, they have learned till now; to make me lift them. I spent about half an hour swapping between both of them due to which my left arm is still shivering. However, it was worth it. May God bless them with loving and caring families. Vipul,good post and it is very clear that your priorities are well defined. This post esp. the last two paragraphs dropped a stone in my heart. I guess that is where the real beauty of nature lies, in children. Definitely inspiring man! I am in fact happy to have a FB like you! As for the rest of the post, I don't listen to Hindi music so I'm hopeless! Btw, I have commented on your post on BEP's "Don't Phunk With My heart"! thnx 4 appreciating my wrk buddy nd ur kind wrds..
as for the remaining post, thrs nowhere tht i talked about hindi or punjabi music in particular. i only shared some wise things tht prsn shared with us. for eg, d opening line of this post or his analogy b/w lyrics nd juice. I absolutely forgot to to comment on the starting! The ending was so moving that I forgot to mention about the terrific starting! Loved the quote!. Well, I talked about Hindi music because, I felt like to! I agree with you, wise words can come from any one! yup, no one amongst us expected him 2 talk so mch sense. moreovr, i myslf havnt heard him mch xpct those two bollywood songs(i was surprisd 2 know how popular he was amongst othrs with me)..
wow this post changed my whole Bohemian views ... loved it !!! Its nice that you are able to spare time for orphan kids.